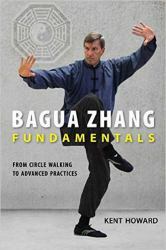 This clear, step-by-step guide to the fundamentals of Bagua Zhang lays out the principles, practices, and underlying philosophy of this cerebral and sophisticated Chinese internal martial art. Leading readers from the most basic precepts of Bagua Zhang practice to advanced techniques, Kent Howard draws on his deep understanding of the art and his decades of teaching to set students on a path toward mastery. While Bagua Zhang is often perceived as a complex martial art that is difficult to learn, Howard breaks it down into clear and easily absorbed principles and exercises that beginners can master and incorporate into higher levels of practice at their own pace. Numerous easy-to-follow photographs illustrate core practices such as circle-walking, post standing, and palm changes, as well as foundandational techniques of posture and alignment, fluid motion, generating whole-body power, absorbing and redirecting energy, striking while in motion, and much more. In addition to providing a solid foundation for a lifetime practice, Bagua Zhang Fundamentals also offers more advanced practitioners valuable tips on how to increase their knowledge and understanding of this multifaceted martial art.